So I went to what I thought was going to the press screening of the Sundance acclaimed John Hawkes starrer, THE SESSIONS, but it turned out I was actually at the press screening for THE SAPPHIRES. My bad, but ins way good, because it meant I came to the film without a clue, with no preconceptions, and totally open to it. And what a ride it was! Because while dressed up in the narrative structure of a romantic comedy, this movies just unique: telling the true story of a 1960s Aussie aborigine girl band and their feckless Irish manager performing soul music for the US troops in Vietnam. The result is a genuinely funny, feel good movie that's full of great tunes, but that doesn't gloss over the grim politics of the time: he racism towards Aborigines, and African Americans, and the horrors of Vietnam. It even touches on perhaps the most shameless chapter in Aussie history, when fairer skinned Aborigines were forcibly separated from their parents and "civilised". Kudos to Aussie director Wayne Blair and to writers Tony Briggs (real life son of one of the Sapphires) and Keith Thompson for finding that perfect balance between joyful energy and political awareness. I also thought the production design of wartime was impressive, particularly given the film's low budget. In front of the camera, Chris is utterly charming as the Irish manager - seriously, is he the most charming man in cinema today? 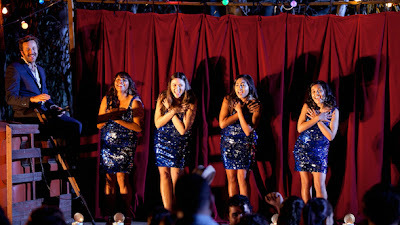 And as the four girls, Deborah Mailman, Jessica Mauboy, Shari Sebbens and Miranda Tapsell all do a fine job. Of course there are gripes. The girls often resolve arguments by singing, even in the much flagged unescorted drive to a gig, the sense of peril is never that high, and more often that not it's painfully obvious that the girls are lip synching. Still, it's testament to the film's energy and joy that one of that bothered me too much. THE SAPPHIRES played Cannes, Toronto, Telluride and London 2012. It was released earlier this year in Australia and France and is currently on release in New Zealand. It opens in the UK and Ireland on November 7th, in Germany on February 7th and in the Netherlands on 21 February 2013.